Aid is not being targeted to those most in need: Education aid received by 170 countries since 2003 has been associated less with need, and more with trade interests. Poor quality education can decrease tax compliance: Low literacy was associated with reduced tax revenue in 123 countries between 1996 and 2010. The 2030 Agenda views today’s social, economic and environmental challenges as indivisible, requiring integrated responses. SDG 17 articulates means of achieving the SDGs and calls for a revitalized global partnership. Its targets highlight the need for cooperation to ensure adequate financing, enhance policy coherence and build multistakeholder partnerships, among other aims. The GEM Report team estimates that the total annual cost of ensuring that every child and adolescent in low and lower middle income countries has access to good quality education from the pre-primary to upper secondary level will rise from US$149 billion to US$340 billion by 2030. The International Commission on the Financing of Global Education Opportunities, announced at the Oslo Summit on Education for Development in July 2015, calls for a New Compact on education, including specific measures to mobilize domestic funds and address the funding gap. The Education 2030 Framework for Action set two benchmarks on domestic financing for education: 4% to 6% of gross domestic product (GDP) and 15% to 20% of public expenditure. Mobilizing more domestic resources will be critical. In about half of all lower income countries, tax ratios are below 15% of GDP, compared with 18% in emerging economies and 26% in advanced economies. Raising the tax ratio in poorer countries requires domestic and global efforts. Education can improve taxpayer behaviour and increase compliance. Low literacy was associated with reduced tax revenue in 123 countries studied with data from 1996 to 2010. Those who avoid paying taxes are often highly educated elites, but education is associated with positive tax-related attitudes. In Latin America, nine countries have included tax education in their curricula through joint efforts between education ministries and tax authorities. Addressing tax evasion and avoidance is also a global responsibility. Recent estimates suggest that lower income countries lose about US$100 billion annually due to multinational tax avoidance via offshore investments. Coordinated domestic and international action on tax incentives, treaties and harmful corporate decisions is needed for lower income countries to recoup lost tax revenue. Many countries could reallocate expenditure for the benefit of education. Two ways to prioritize spending for education are to remove fossil fuel subsidies and to earmark education funds. In Indonesia, public expenditure on education increased by over 60% between 2005 and 2009, largely due to fuel subsidy reforms. Even assuming domestic revenue mobilization is improved, however, an annual US$39 billion financing gap remains. International aid will continue to be a necessity for many low income countries. Yet the volume of aid to education fell by about US$600 million from 2013 to 2014. In this context, three options show promise: earmarking more funds for education through multilateral mechanisms; using more aid to build national authorities’ capacity to increase domestic resources; and better targeting aid to the countries and education levels most in need. There is much room for improvement: Despite the significant benefits of early investment in education, early childhood care and education received only US$ 106 million in direct aid in 2014, less than 3% of the amount for post-secondary. Sector-specific approaches are insufficient to meet the interdependent challenges of sustainable development. The broad SDG agenda requires multisector approaches. In education, cross-sector interventions include integrated initiatives in school feeding and school health, early childhood development, and skills and livelihood training. At the national level, successful efforts to improve multisector planning reflect the importance of political will, institutional support, adequate capacity and sufficient data. In Nigeria, debt relief funds were used to support local service delivery in education, health and water and sanitation in support of the Millennium Development Goals. Colombia’s national development plan views education, peace and equity as presidential priorities; it aims to be the most educated country in Latin America by 2025. Government agencies typically tend to focus on policy formulation and implementation in their respective sectors, hampering coordination and collaboration. Well-developed national plans that are linked to good education financing plans and decentralized planning and financing systems, and that lead to good crosssector integration, are the exception rather than the rule in most poorer countries. Donor agencies face two challenges in delivering programmes that are consistent with the integrated planning needs of the SDGs: they may lack a coherent vision of their approach to development, and they have difficulties coordinating multisector programmes. Aid is not being allocated adequately according to country needs. 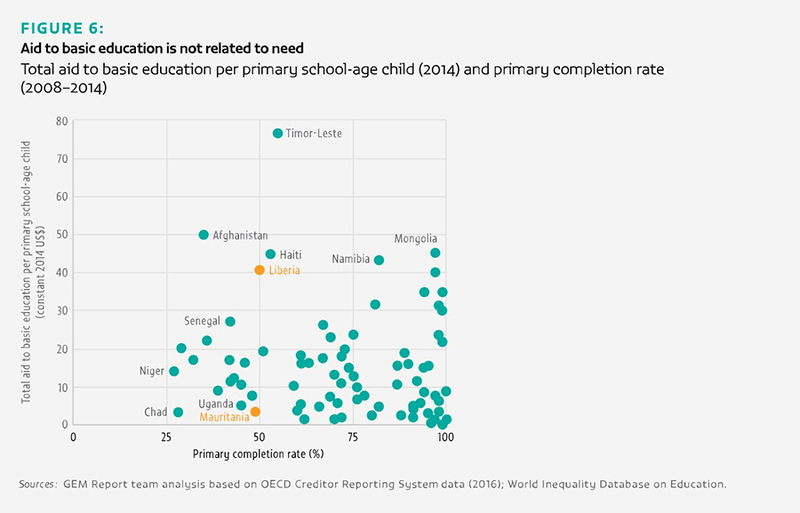 In Liberia and Mauritania, about half the children complete primary school, but Liberia receives 10 times the amount of aid to basic education per school-age child. Local and national government authorities, civil society, academics, the scientific community, the private sector and global multistakeholder organizations are some of the partners that can help implement global agendas such as the SDGs. Civil society, the private sector and multistakeholder partnerships have substantial roles in financing, implementing and ensuring mutual accountability of the new agenda, which is expected to be driven by national governments. Increased civil society activity was a major achievement of the EFA agenda. But there are challenges in designing civil society partnerships more productively. How can organizations heavily dependent on donor funding maintain an independent voice? Another challenge is the enormous variety of disparate actors under the civil society umbrella. The dynamism and funding that the private sector can bring to the SDGs is reason for optimism. But while some hail the growth of private involvement as bringing financing, flexibility, innovation and improved learning outcomes, sceptics see a potential for widening inequality and undue market influence in schooling. The role of coordination and financing bodies is critical. The global education coordination mechanism includes the SDG-Education 2030 Steering Committee, Global Education Meetings, regional meetings and collective bodies of NGOs. The Steering Committee is expected to be the main mechanism to support countries, review progress and encourage coordination of partner activities. The Global Partnership for Education, the education sector’s principal multistakeholder partnership, could learn from such health sector partnerships as the Global Fund for Tuberculosis, Aids and Malaria and GAVI, which leverage substantial funds. The new Education Cannot Wait fund aims to raise money for targeted education for those affected by conflict, natural disasters and disease outbreaks.